Method of type curve is applied for time-drawdown, time-distance drawdown plot analysis, and for only few conceptual schemes - for analysis of distance-drawdown plot. 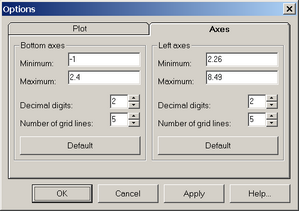 Simultaneously with the type curve, the "Value" supplemental window is displayed showing previously selected wells (or observation points on distance-drawdown plot) as well as parameters estimated by method of type curve. Normally, the method is applied to the whole diagnostic curve. Aquifer test analysis with the method of type curve.